In my eBook reading experience, I’ve seen some web-based eBooks reader. But few of them are running well in these years. Some are closed, like bookish; some are turning the business model, like 24symbols. But now, the game may be restarted again. Amazon has rebuilt their web-based reader, make it more powerful and friendly. 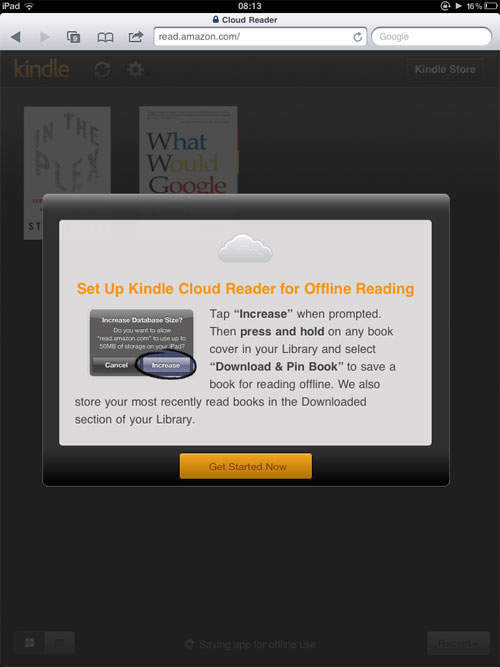 The Kindle Cloud Reader. It’s basically a web reader that lets you read books online, or download and read them offline. It supports Chrome, Safari and Firefox browsers, so it can be used on PC, Mac, Linux, etc. Of course, it can also be used on iPad. Click the link to navigate to the cloud reader, you will see the screen like this. 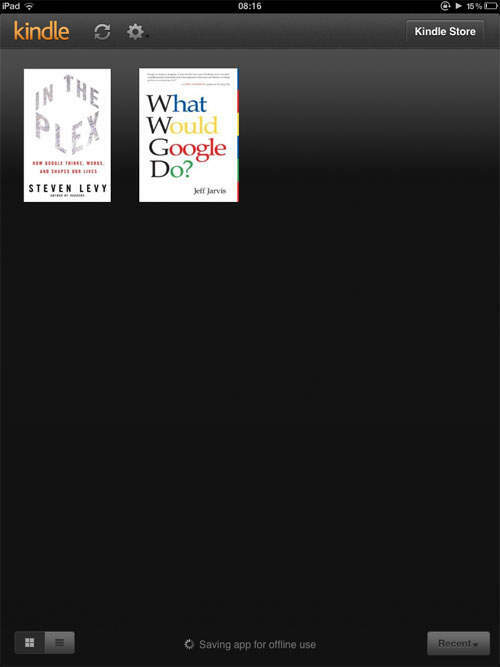 “Cloud” tab contains all the books in your Kindle library. Double click on a book’s cover, the book will open and you can start to read it. Look at the lower right corner of the reading screen, you can see a tiny “Downloading” process. Notice, this doesn’t mean the book is downloaded to your computer as an eBook file. This is only downloading to your web browser’s cache, then you can read the book even if you are offline. This is really a big advantage compared to other web-based eBook readers. 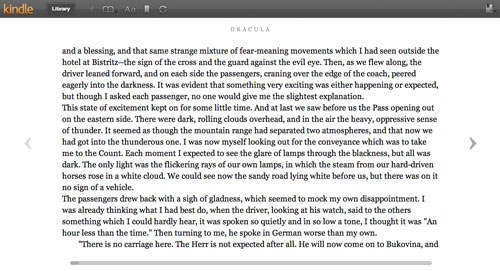 As a web-based eBook reader, it provides an immersed reading experience which is beyond my expectation. Move the mouse to the top or bottom of the screen, the control panel will show up in the top, and the reading location in the bottom. Since the Kindle Cloud Reader currently supports the iPad version of Safari, this means Kindle users are able to access books directly from the browser instead of the Kindle for iPad app. At the same time, it means that Amazon does not have to abide by the rules that Apple takes a cut from all apps published in iOS platform. The Kindle Cloud Reader takes advantage of HTML5 technology to create a new web reading platform that can be read not only on computers and tablets, but also on Chromebooks and other mobile devices in the future, as long as there is support for the corresponding HTML5 browser. Kindle’s reading platform is increasingly available on both Mac and PC, as well as mobile devices. Now, with the addition of the browser platform, it can be said to include everything.If you only read e-books, the Kindle is more competitive than the iPad. Can’t use the offline reading function? That is because of your web browser doesn’t support local cache or local storage. By changing the browser’s settings we can solve the problem. Chrome and Safari: if you refresh the page, there will be screen prompts, just follow them you can solve the problem. Firefox: Click the lock icon — More Information — Permissions — Maintain Offline Storage — Use Default — select Allow. Internet Explorer: Click the Gear icon — Internet Options — Settings — Caches and Databases — Allow website caches and databases — confirm the changes. Many people couldn’t find the Lock icon and asked me how to set it. I take Firefox as an example to explain offline reading Settings. Open your Kindle cloud reader interface, and the lock icon is on the left side of the HTTP address bar in your browser. Click it. From all aspects, Kindle Cloud Reader is the best web-based eBook reader among all the competitions. It also provides a Chrome extension, makes it easier to access. The only flaw is, the Amazon Cloud Reader only supports the books bought from Amazon. For the personal documents send to library, we can’t read them in Amazon Cloud Reader.